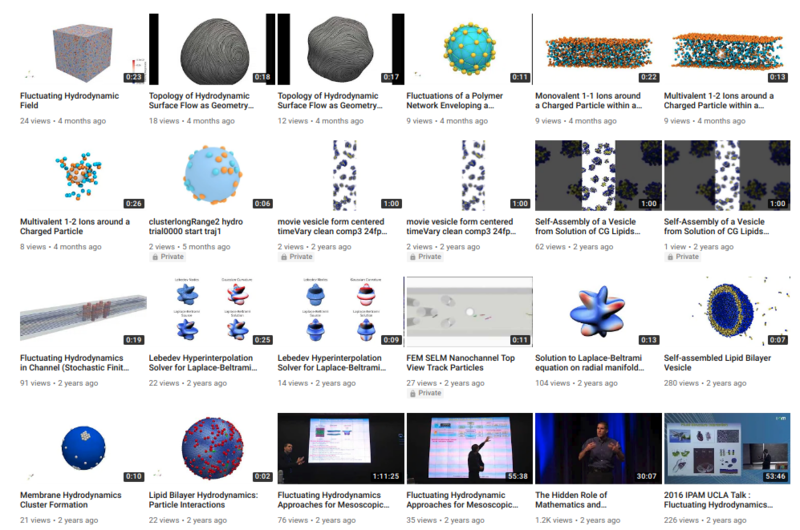 Current collection of videos and related information can be found at Atzberger YouTube Channel. Molecular self-assembly of a lipid bilayer vesicle based on an Implicit-Solvent Coarse-Grained (IS-CG) model of the lipids [paper] [paper]. More information. Rotational view of the self-assembled lipid bilayer vesicle. [paper] [paper]. More information. Fluctuating hydrodynamics simulation of a self-assembled lipid vesicle used to probe material properties of the bilayer [paper] [paper]. More information. Diffusing particles subject to hydrodynamic flow within a channel with obstacles. Notice the wall proximity taken into account in the drift-diffusion dynamics. Stochastic Finite Element Methods developed for Fluctuating Hydrodynamics handling complex geometries. [paper]. More information. Solution to Laplace Beltrami equation on a radial manifold used during tests of numerical exterior calculus methods we are developing based on Lebedev hyperinterpolation. Related to [paper] [paper]. More information. Particle inclusions with hydrodynamically mediated interactions within a lipid bilayer membrane. Simulations performed using numerical exterior calculus methods developed using Lebedev hyperinterpolation, [paper]. More information. Image processing for microtubule undulations to infer bending elasticity from passive thermal fluctuations. Approach based on a variation method representing the polymer using Chebeyshev orthogonal polynomials. Developed for part of an experimental assay for investigating the mechanical roles played by microtubule associated proteins [paper1], [paper2]. More information. Polymeric material subject to shear. Methods developed for incorporating shear boundary conditions into fluctuating hydrodynamics descriptions for investigating viscoelastic responses [paper]. More information. Particle inclusions within bilayer forming clusters when subject to hydrodynamic coupling in their drift-diffusion dynamics. Simulations performed using numerical exterior calculus methods developed using Lebedev hyperinterpolation [paper]. More information. Fluctuation-induced pattern formation in reaction-diffusion system. Stochastic methods for SPDEs on non-uniform structured adaptive meshes [paper]. More information. Brownian motion of a colloid in a Lennard-Jones fluid. More information. Poincare Sections of Duffing Oscillator. More information. Diffusion of a protein within a bilayer that induces local curvature (metric one dynamics) [paper] [paper]. More information. Protein diffusion and membrane fluctuations for 25 embedded inclusions that are rigid and flat [paper] [paper]. More information. Protein diffusion and membrane fluctuations for 50 embedded inclusions that are rigid and flat [paper] [paper]. More information. Motor Protein subject to no opposing flow. Simulations performed using our fluctuating hydrodynamics methods [paper]. More information. Motor Protein subject to moderate opposing flow. Simulations performed using our fluctuating hydrodynamics methods [paper]. More information. Motor Protein subject to large opposing flow. Simulations performed using our fluctuating hydrodynamics methods [paper]. More information. Brownian motion of unknotted polymer subject to hydrodynamic coupling. Simulations performed using our Stochastic Immersed Boundary Methods [paper]. More information. Brownian motion of trefoil knotted polymer subject to hydrodynamic coupling. Simulations performed using our Stochastic Immersed Boundary Methods [paper]. More information. Brownian motion of figure-eight knotted polymer subject to hydrodynamic coupling. Simulations performed using our Stochastic Immersed Boundary Methods [paper]. More information. You can also right-click to open the video in a new window.